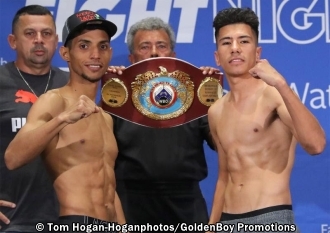 Acosta vs. Rodriguez is a 12-round fight for the WBO Light Flyweight World Title presented by Golden Boy Promotions and Miguel Cotto Promotions. 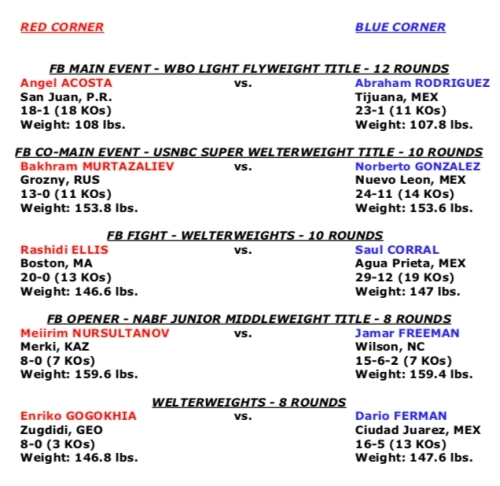 Murtazaliev vs. TBA is a 10-round junior middleweight fight presented by Main Events and Golden Boy Promotions. The event is sponsored by Tecate, "THE OFFICIAL BEER OF BOXING" and Hennessy, "Never Stop, Never Settle." The fights will take place on Saturday, Oct. 13, 2018 at The Joint at the Hard Rock Hotel & Casino, Las Vegas. Doors to the event open at 4:30 p.m PT, and the first fight begins at 5:00 p.m. PT. The action will be streamed live globally on Facebook Watch via the Golden Boy Fight Night Page beginning at 6:00 p.m. PT/9:00 p.m. ET. Tickets for Acosta vs. Rodriguez are on sale and are priced at $75, $50, $25, and $10, not including applicable service charges and taxes. To charge by phone with a major credit card, call Ticketmaster at (800) 745-3000 or The Joint Box Office at (702) 693-5000. Tickets will also be available for purchase at www.goldenboytickets.com and www.ticketmaster.com. https://www.facebook.com/hardrockhotellv/. Follow on Instagram @GoldenBoyBoxing and @HardRockHotelLV. Follow the conversation using #GBPonFB and #AcostaRodriguez.